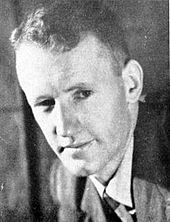 Ian Smith replaced Winston Field as Southern Rhodesian Prime Minister in April 1964, and pledged to challenge Britain on independence. Attempting to form a viable white opposition to the Rhodesian Front, the UFP resurrected itself around Welensky, renamed itself the Rhodesia Party, and entered the Arundel and Avondale by-elections that had been called for 1 October 1964. Perturbed by the prospect of having to face the political heavyweight Welensky in parliament at the head of the opposition, the RF poured huge resources into winning both of these former UFP safe seats, and fielded Clifford Dupont, Smith's deputy, against Welensky in Arundel. [n 15] The RF won both seats comfortably, and the Rhodesia Party soon faded away. Spurred on by this success, Smith organised the indaba for 22 October, and called a general independence referendum for 5 November 1964. Meanwhile, Wilson wrote a number of letters to black Southern Rhodesians, assuring them that "the Labour Party is totally opposed to granting independence to Southern Rhodesia so long as the government of that country remains under the control of the white minority". The United States Declaration of Independence was used by the Rhodesians as the model for their UDI. The front page of the Rhodesia Herald's 12 November 1965 edition. Note the blank spaces where content was removed by state censors. A week after UDI, Smith's government announced that Dupont, the Deputy Prime Minister, had resigned from the Cabinet to accept the post of Officer Administering the Government created by the 1965 constitution. Attempting to assert his claimed prerogative as Her Majesty's Rhodesian Prime Minister, Smith advised the Queen by letter to appoint Dupont as Governor-General to supersede Gibbs. The letter was ignored. Dupont nevertheless effectively replaced the Governor. The Smith administration assigned him the Governor's official residence at Government House, but no attempt was made to forcibly remove Gibbs and his entourage; the post-UDI government stated that the Officer Administering the Government would live at Governor's Lodge instead "until Government House, at present temporarily occupied by Sir Humphrey Gibbs in a private capacity, becomes available". Rhodesian black nationalists and their overseas supporters, prominently the OAU, clamoured for Britain to remove Smith's government with a military invasion, but Britain dismissed this option because of various logistical issues, the risk of provoking a pre-emptive Rhodesian strike on Zambia, and the psychological problems that were likely to accompany any confrontation between British and Rhodesian troops in what Smith said would be a "fratricidal war". Wilson instead resolved to end the Rhodesian rebellion through economic sanctions; these principally comprised the expulsion of Rhodesia from the Sterling area, a ban on the import of Rhodesian sugar, tobacco, chrome and other goods, and an oil boycott of Rhodesia. When the Rhodesians continued to receive oil, Wilson attempted to directly cut off their main supply lines, namely the Portuguese Mozambican ports at Beira and Lourenço Marques, by posting a Royal Navy squadron to the Mozambique Channel in March 1966. This blockade, the Beira Patrol, was endorsed the following month by UN Security Council Resolution 221. The United Nations proceeded to institute the first mandatory trade sanctions in its history with Security Council Resolutions 232 (December 1966) and 253 (April 1968), which required member states to cease all trade and economic links with Rhodesia. 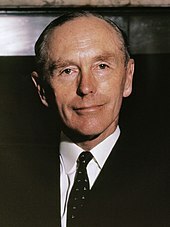 Wilson predicted in January 1966 that the various boycotts would force Smith to give in "within a matter of weeks rather than months", but the British and UN sanctions had little effect on Rhodesia, largely because South Africa and Portugal went on trading with the breakaway colony, providing it with oil and other key resources. Clandestine "sanction-busting" trade with other nations also continued, initially at a reduced level, and the diminished presence of foreign competitors helped domestic industries to slowly mature and expand. Rhodesia thus avoided the economic collapse predicted by Wilson and gradually became more self-sufficient. The Rhodesian government set up a string of front holding companies in Switzerland, Luxembourg and Liechtenstein to help keep trade open, with some success; goods that had previously been imported from Britain were replaced by Japanese, French and West German equivalents. Even many OAU states, while bombarding Rhodesia with vitriol, continued importing Rhodesian food and other products. The United States created a formal exception in its embargo with the Byrd Amendment of 1971, under which the US replaced its import of chrome from the Soviet Union with Rhodesian chrome ore. This breach of the UN sanctions, passed by the US Congress on the back of anti-communist Cold War considerations, was warmly welcomed by several white Southerners in Congress; it aided the Rhodesian economy until 1977, when the newly elected President Jimmy Carter successfully pushed Congress to repeal it. Rhodesia House, the Rhodesian High Commission in London, represented Smith's government in the UK until 1969, and became a regular target for political activists. ^ a b c Renamed Zimbabwe in 1980. The official name of the colony under British law was Southern Rhodesia, but the colonial government switched to using the name Rhodesia in October 1964, when Northern Rhodesia changed its name to Zambia concurrently with its independence from Britain. ^ Powers reserved to the British government at Whitehall under the 1923 constitution concerned foreign affairs, alterations to the constitution, the British-appointed Governor's salary, and bills regarding native administration, mining revenues and railways. Laws relevant to these subjects had to receive assent from the Governor (and, by extension, Whitehall), but all other bills could be passed by Salisbury without interference. ^ The original vision shared by Huggins and his Northern Rhodesian counterpart Sir Roy Welensky was a unitary amalgamation of the two Rhodesias that would eventually become a dominion. 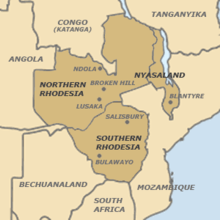 British politicians rejected this idea, asserting that black Northern Rhodesians would never accept it, but agreed to consider a Federation on the condition that neighbouring Nyasaland was also included. ^ Southern Rhodesian politicians from various parties later claimed that had Federation not occurred, Southern Rhodesia would have been a dominion by 1955. ^ With Northern Rhodesia and Nyasaland under direct British control, a Federal UDI would have been far more complicated and difficult to execute than one by Southern Rhodesia alone. Indeed, it was partly because of this that Welensky deemed it infeasible. ^ Zimbabwe, derived from the name applied by the Shona people to the ancient ruined city today referred to as Great Zimbabwe, was adopted by the black Rhodesian movement between 1960 and 1962 as their preferred name for a majority-ruled Southern Rhodesia. ZAPU was banned by the Whitehead administration in 1962 because of its violent activities, but it continued operating nevertheless, publicly calling itself the People's Caretaker Council (PCC). Several prominent members left to form the rival Zimbabwe African National Union (ZANU) in 1963. ZANU and ZAPU were respectively backed by China and the Soviet Union, and influenced to various degrees by Chinese Maoism and Soviet Marxism–Leninism. Following an escalation in internecine political violence between the two movements, a spate of industrial sabotage and civil disobedience and the politically motivated killing of a white man, Petrus Oberholzer, by ZANU insurgents, both PCC and ZANU were banned by Smith's government in August 1964, with most of each party's leaders concurrently jailed for criminal offences or otherwise restricted. Both movements thereafter based themselves overseas. ^ Welensky was so shaken by Sandys' statement that he suffered a migraine. Lord Alport, the UK's High Commissioner to the Federation, reportedly left the meeting and vomited. ^ In particular, Field and Smith claimed that Butler told them at Victoria Falls on 27 June 1963 that in return for their help in winding up the Federation, Southern Rhodesia would be granted "independence no later than, if not before, the other two territories ... in view of your country's wonderful record of Responsible Government over the past forty years ... and above all the great loyalty you have always given to Britain in time of war". ^ Douglas-Home was only a few days into his premiership following Macmillan's resignation on grounds of ill health. At one point during the meeting on 31 October 1964 he told Smith that though he opposed unilateral action, he felt Southern Rhodesia could "declare herself independent, [and] would be within her rights to do so". Scandalised, British civil servants withheld record of this comment from their Southern Rhodesian counterparts. 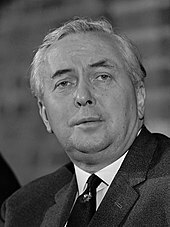 ^ In particular, a small but vocal phalanx of stridently pro-Salisbury Conservative peers emerged in the House of Lords, including Lord Salisbury (after whose grandfather the Southern Rhodesian capital was named), Lord Coleraine and Lord Grimston. Together with an ancillary group of similarly minded Conservative MPs in the Commons, headed by Major Patrick Wall, these became referred to as the "Rhodesia Lobby". ^ The Lardner-Burke bill proposed that a two-thirds majority in the Legislative Assembly would prompt automatic consent for alterations from the Governor, who would then sign them into law on behalf of the Queen. William Harper, the Minister of Water Development and Roads, posited that if this passed, Salisbury would be able to proclaim an independent republic outside the Commonwealth with a two-thirds majority in parliament. ^ Roy Welensky, who held the Federal premiership from 1956 to dissolution in 1963, was also born in Southern Rhodesia. Before Smith, Southern Rhodesia had had seven Prime Ministers, three of whom (including Field) had been born in Britain. The country's first two Prime Ministers, Charles Coghlan (1923–27) and Howard Moffat (1927–33), were respectively born in South Africa and Bechuanaland, while Garfield Todd (1953–58) was originally from New Zealand. Edgar Whitehead (1958–62) was born at the British Embassy in Germany, where his father was a diplomat. ^ Britain told Southern Rhodesia that this was because the British economy was in trouble. When Salisbury pointed out that the UK was still giving aid to other countries, Whitehall implied that financial assistance might resume if progress was made towards an independence settlement acceptable to Britain. ^ Salisbury attended under the Federal flag from 1953 to 1963. ^ During the bitterly fought campaign, Welensky was falsely personified by his opponents as representing appeasement of Britain and black extremists, and heckled at public concourses with cries of "communist", "traitor" and "coward"; one man even screamed "you bloody Jew" at Welensky during a debate. ^ Official observers came from Australia, Austria, France, Greece, New Zealand, Norway, Portugal, South Africa and Sweden. ^ Salisbury passed legislation to shorten the name, but Britain ruled this ultra vires as the laws naming the country were British acts passed at Westminster. Salisbury went on using the shortened name in an official manner anyway, while the British government, the United Nations and other overseas bodies continued referring to the country as Southern Rhodesia. This situation continued throughout the UDI period. ^ Turnout was 61% of the 105,444 registered voters (89,886 whites, 12,729 blacks and 2,829 coloureds and Asians). There were 58,091 ballots in favour, 6,096 against and 944 spoilt papers. Most eligible non-whites reportedly abstained. ^ The electoral system devised in the 1961 constitution replaced the common voters' roll with two rolls, the "A" roll and the "B" roll, the latter of which had lower qualifications intended to make it easier for prospective voters to enter the political system. There were 50 "A"-roll constituencies and 15 larger "B"-roll districts, with a complicated mechanism of "cross-voting" allowing "B"-roll voters to slightly influence "A"-roll elections and vice versa. This system was theoretically non-racial, but in practice the "A" roll was largely white and the "B" roll was almost all black. ^ When they then repeatedly referred to Smith's government as "the illegal regime" during parliamentary discussions, Stumbles ruled the term out of order. ^ Australia and Canada shut down their trade missions in Salisbury, while Finland, Sweden and Turkey closed their honorary consulates. Denmark, France, Italy, Japan and the United States withdrew their heads of mission, but kept their offices open. Austria, Belgium, Greece, the Netherlands, Norway, Portugal and Switzerland retained their representative missions in Salisbury at the same levels as before UDI. ^ This overall design dated back to 1923, but a darker blue field was used until 1964, when the shade was lightened to make the Rhodesian flag more recognisable. Brownell, Josiah (2010). "'A Sordid Tussle on the Strand': Rhodesia House during the UDI Rebellion (1965–80)". The Journal of Imperial and Commonwealth History. 38 (3): 471–499. doi:10.1080/03086534.2010.503398. Hall, Lee (27 May 1966). "Rhodesia's Face of Defiance". Life: 22–30. Retrieved 11 June 2013. McWilliam, Michael (January 2003). "Zimbabwe and the Commonwealth". The Round Table. 92 (368): 89–98. doi:10.1080/750456746. Mobley, Richard (Winter 2002). "The Beira patrol: Britain's broken blockade against Rhodesia". Naval War College Review. LV (1): 63–84. Archived from the original on 14 September 2014. Moorcraft, Paul (1990). "Rhodesia's War of Independence". History Today. 40 (9). ISSN 0018-2753. Retrieved 11 June 2013. Nyamunda, Tinashe (2016). "'More a Cause than a Country': Historiography, UDI and the Crisis of Decolonisation in Rhodesia". Journal of Southern African Studies. 42 (5): 1005–1019. doi:10.1080/03057070.2016.1222796. ISSN 0305-7070. Peaden, W R (1979). "Aspects of the Church and its Political Involvement in Southern Rhodesia, 1959–1972" (PDF). Zambezia. 7 (2): 191–210. ISSN 0379-0622. Retrieved 4 July 2013. Ranger, Terence (1997). "Violence Variously Remembered: the Killing of Pieter Oberholzer in July 1964". History in Africa. 24: 273–286. doi:10.2307/3172030. JSTOR 3172030. Lord St Brides (April 1980). "The Lessons of Zimbabwe-Rhodesia". International Security. 4 (4): 177–184. doi:10.2307/2626673. JSTOR 2626673. Winn, Michael (7 May 1979). "Despite Rhodesia's Elections, Robert Mugabe Vows to Wage Guerrilla War 'to the Last Man'". People. 11 (18). Retrieved 11 June 2013. "Rhodesia: The Shortened Fuse". Time. 3 December 1965. Retrieved 24 July 2013. Gowlland-Debbas, Vera (1990). Collective Responses to Illegal Acts in International Law: United Nations action in the question of Southern Rhodesia (First ed.). Leiden and New York: Martinus Nijhoff Publishers. ISBN 978-0-7923-0811-9. Hillier, Tim (1998). Sourcebook on Public International Law (First ed.). London & Sydney: Cavendish Publishing. ISBN 978-1-85941-050-9. Jackson, Robert H (1990). Quasi-States: Sovereignty, International Relations and the Third World. Cambridge, England: Cambridge University Press. ISBN 978-0-521-44783-6. Mazrui, Ali Al'Amin, ed. (1993). General History of Africa, VIII: Africa Since 1935 (First ed.). Paris: United Nations Educational, Scientific and Cultural Organization. ISBN 978-92-3-102758-1. McLaughlin, Peter (1980). Ragtime Soldiers: the Rhodesian Experience in the First World War. Bulawayo: Books of Zimbabwe. ISBN 978-0-86920-232-6. Olson, James Stuart; Shadle, Robert, eds. (1996). Historical Dictionary of the British Empire: K–Z. Westport, Connecticut: Greenwood Publishing Group. ISBN 978-0-313-27917-1. Windrich, Elaine (1978). Britain and the Politics of Rhodesian Independence. London: Croom Helm. ISBN 978-0-85664-709-3.